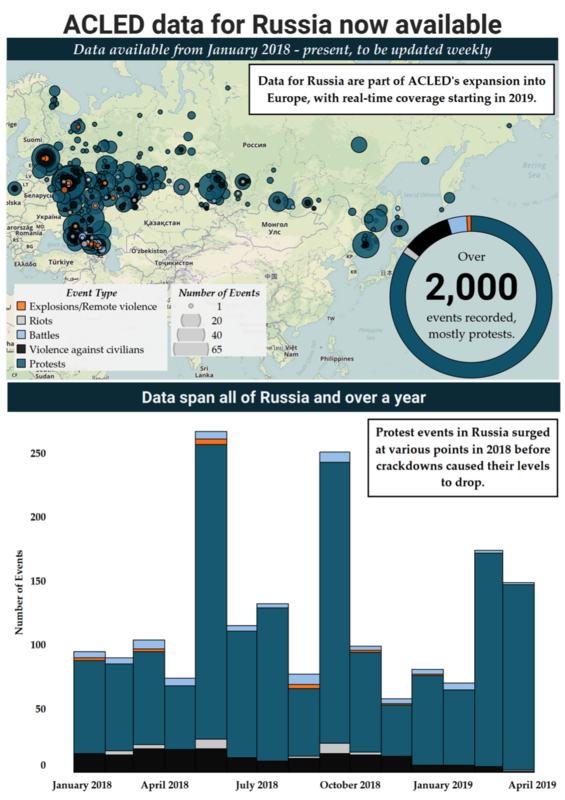 Over 2,000 political violence and protest events took place in Russia in 2018. A vast majority of these were protest events, including anti-government protests and demonstrations against various proposed reforms and pension reforms in particular. While most of these protests did not involve intervention or violence, over 65% of all protests with intervention across Europe took place in Russia, indicating the Russian government’s comparative willingness to intervene in protests relative to its neighbors. Some armed clashes and violence against civilians have also taken place in the North Caucasus region in Russia’s far southwest, while across the country and consistently over time violence against civilians by the Russian police remains common. Protests against government corruption and waste management, which began in March of 2018 and were suppressed, have again surged in February 2019, and may again be met with crackdowns.